The 85mm f/1.4 lens is a classic focal length, long considered the ideal for portraiture, along with landscapes, close up sports and low light photography. 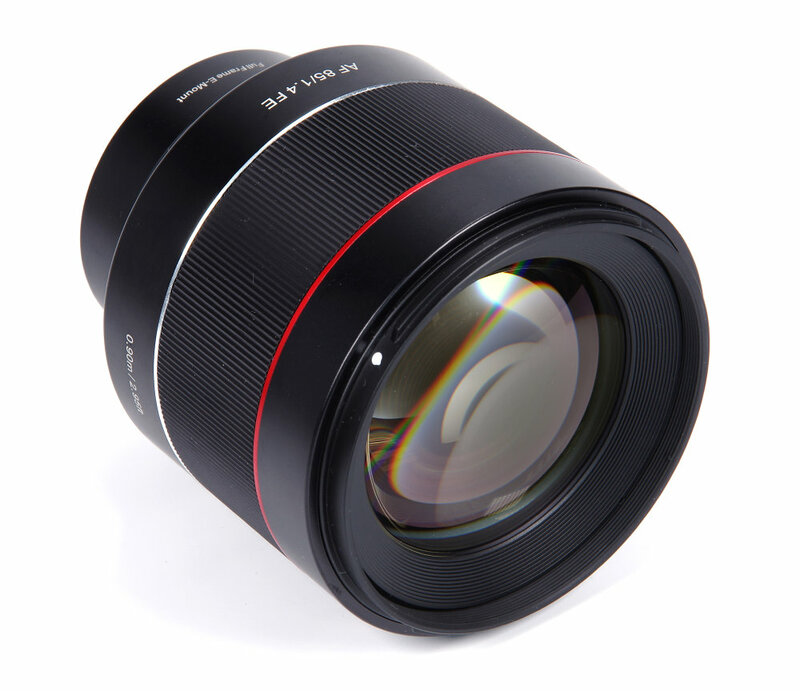 Lenses slightly longer than the standard for a format have also traditionally been the pinnacle of optical quality within a range. 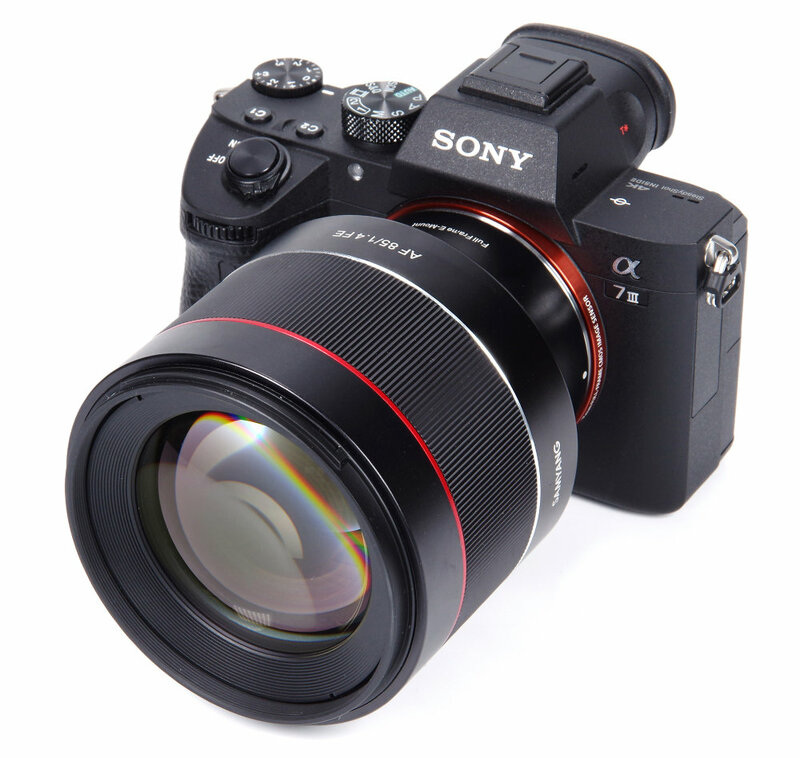 Samyang have been building an enviable reputation for quality lenses, first in manual focus, more recently moving successfully into AF and now also encompassing the full frame mirrorless Sony cameras. Let's have a closer look, using the 24MP Sony Alpha A7 III body. 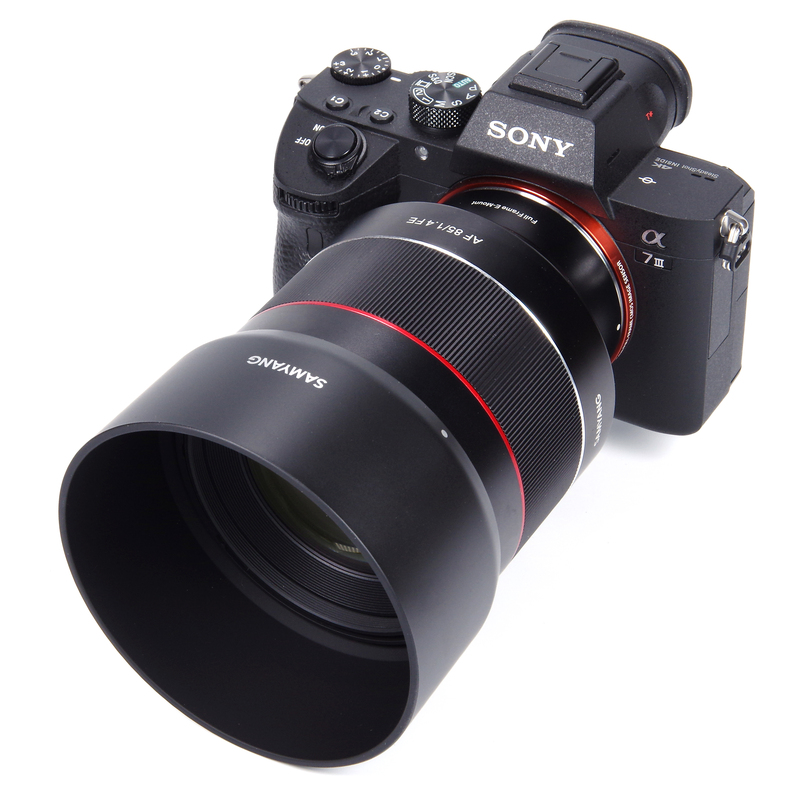 Weighing in at a solid, but not over-heavy 568g this chunky Samyang lens has all the quality of construction that we have come to expect. It inspires confidence from the start that it will give good, long service. It is weather resistant and is claimed to be splashproof and dustproof, a feature that is rapidly becoming virtually essential in our variable climate. Starting at the front of the lens, a generously sized round lens hood is provided. This bayonets securely into place. Within this fitting we find a standard 77mm filter thread. The only other adornment on the lens is the wide manual focus ring. This has no function in normal AF settings, but activates when either the MF option is selected in the camera menu or DMF (Direct Manual Focus) is chosen. DMF means that the manual focus ring is active whilst AF is being employed. AF is driven quickly and silently by DLSM – Dual Linear Sonic Motor. 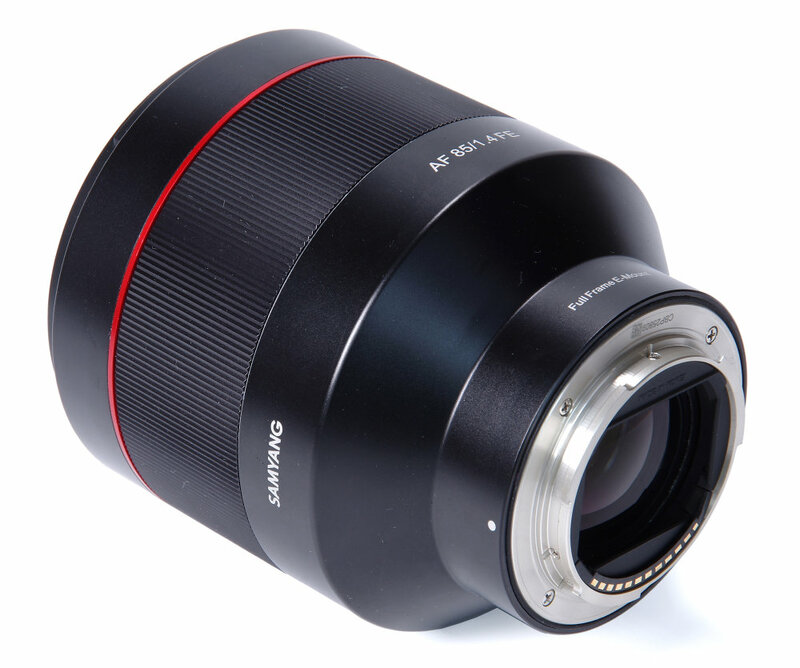 The lens focuses down to 0.9m, or 2.95 feet, a maximum magnification of 0.11x. This is about what we would expect from an 85mm lens. In terms of portraits we are close enough to the model to communicate properly and far enough away so that the perspective is attractive and flattering. Optical construction is 11 elements in 8 groups, including 4 HR (High Refractive Index) and 1 ED (Extra Low Dispersion) elements. UMC coating is Samyang's own version of Ultra Multicoating. There are 9 blades in the diaphragm, to assist in producing smooth bokeh; the quality and gradation of the out of focus areas in an image. It is such a simple lens in terms of controls, partly because all functions are dealt with by the camera body. This includes shake reduction, the lens itself needing none as the Sony cameras have SteadyShot built in. This outward simplicity has benefits, allowing us to concentrate purely on the photography. This does give a sense of freedom, combined with the pleasure of the beautifully narrow depth of field that is possible with an 85mm and the f/1.4 widest aperture. Subjects can be isolated with tremendous clarity against a diffused background. It is easy to see why 85mm lenses are considered to be portrait lenses, although they are fully capable in many other applications as well. AF is fast and precise, MF very easy to use as the image snaps in and out of focus very crisply. There is really nothing else to do with this minimalistic lens other that shoot images and it makes it a pleasure to do so. Why did you choose the 24MP Sony Alpha 7 III for this review whilst you used the 42MP Sony Alpha 7R II for the Sony FE 85mm f/1.8 and 85mm f/1.4 G Master, hence making any comparison impossible? It's a matter of availablility rather than choice, but the good news is that an A7R III suddenly became available, a bit late in the day but I've just completed another set of Imatest results and hopefully Josh can add those results in the near future. I was just going to comment about using the A7RIII, but I see you responded to it. Thanks a lot for the review, and I can't wait to see the results with the A7RIII! That Samyang lens seems promising. 85mm a focal length that will be mostly used for portrait and people buy f1.4 for the background blur and bokeh, why do we get mostly landscape shots in the gallery examples? We aim for a mix of subject matter, with a checklist that makes sure that various requirements are looked at. So, portraits, architecture, close up, flare test, CA test, bokeh shots, texture shots, landscapes and many more are all covered. 85mm lenses are used for portraits in particular, but also excel at other medium range telephoto applications. An added bonus with this lens is that it's razor sharp wide open as well as stopped down. I have an original A7 would the lens AF work well with this old camera? Within the limitations of the performance of the A7 system there's no obvious reason why it wouldn't work, but to be sure then it would need to be tried. Visiting a Samyang stockist or an exhibition would be the best way to be sure. Unless, that is, someone on here has the combination and has tried it? [quote]It's a matter of availablility rather than choice, but the good news is that an A7R III suddenly became available, a bit late in the day but I've just completed another set of Imatest results and hopefully Josh can add those results in the near future. [/quote] Thank you for adding the Alpha 7R III MTF and CA charts. [quote]I have an original A7 would the lens AF work well with this old camera? [/quote] Tested OK on two antiques - NEX-3 and A7.